Comfort, great audio quality and more. Many different considerations go into the selection of your in-ear monitors; comfort, sound, value and reliability for starters. They are among the most intimate and personal pieces of equipment in your arsenal, and they are critical to high level vocal performance. The Wi Digital SEM15 in-ear reference monitors excel in each category. Inside the Wi Micro-In-Ear Personal Reference Monitors you'll find the product of Wi Digital's passion. A refined and perfected proprietary In-Ear-Canal driver design, engineered to deliver the highest sound quality directly and beautifully into the ear canal where it belongs. And of course, they feature the sound that made Wi Digital Systems famous - brilliant instrumental sounds and vocals with crystal clear high notes, a well-defined mid range, and rich, powerful low end for an excellent sound experience. precision balanced Neodymium single driver in a solid brass housing placed directly in the ear canal. 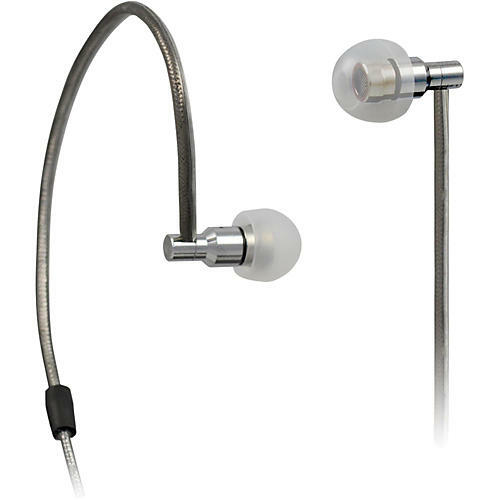 This contrasts with most current in-ear monitor designs which are bulkier and may have multiple drivers located outside of the ear and utilize bore sound channels to project the sound inside the ear. The Wi Digital Micro-In-Ear driver placement inside the ear canal delivers a much fuller sound experience with deep bass and crisp high tones as the driver reverberates within the ear canal. The ultra-small 5.5mm, ergonomically correct, timeless minimalist design Wi Micro-In-Ear monitors are nearly invisible to audiences from any angle making you the center of attention. Designed to look, feel and fit like no other In-Ear monitors, the feather-weight Wi Micro-In-Ear monitors are incredibly easy to wear even for an extended time. Engineered with bendable metal reinforced ear loops, the Wi Micro-In-Ear monitors are superbly constructed to ensure a comfortable fit and secure placement, with practically no weight pressure on your ears. Wi Digital's exclusive tangle and kink resistant cable is designed to resolve itself quickly and easily with a simple and gentle shake. Wi Micro-In-Ear noise-isolating reference monitors can provide -26dB of isolation and passive noise cancellation when properly worn. Designed to withstand heavy perspiration, the Wi Micro-In-Ear monitors can be used in all types of weather and environments. Order today and experience quality in-ears. Cable Construction: Wi Digital's exclusive low-distortion, tangle & kink resistant cable.